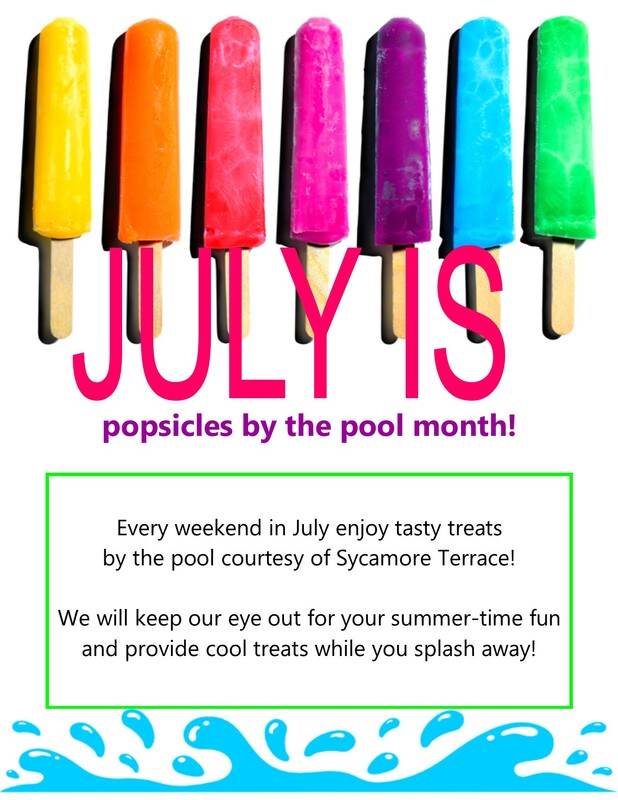 Temecula, California (June 3, 2016) – Sycamore Terrace Apartments celebrates “Popsicle by the Pool Month” again as summer becomes official for residents living in and around Temecula. On top of the luxurious pool amenities offered all year round and especially throughout the summer season, the company goes the extra mile to make life fun and comfortable for residents. One way the management staff achieves that is by creating new and exciting offers. Starting July 1 through July 31, management will be hosting cool treats to pool goers every weekend. This way, families, particularly children can have an even grander time cooling off and beating the heat at the pool. Sycamore Terrace Apartments features 2 sparkling pools and spas that can accommodate all the tenants who want to go in for a refreshing dip. These pools are regularly maintained by a dedicated onsite staff to keep it clean. For those who like to swim at night but can’t tolerate colder temperatures, one of the pools has constant heating all year round to keep it at an even 70 degrees. The management sees it as their duty to be aware of the tenants needs, thus they take the initiative to organize events like these. In fact, in the month of June, Sycamore Terrace Apartments brought back a popular tradition called “Root Beer Floats by the Pool” at the big pool behind the Clubhouse. Residents seem to enjoy the Cooling-Off Party thrown, complete with the root beer floats, which is why management opted to follow up quickly with a Popsicles by the Pool month. In keeping with a yearly tradition cool treats will be distributed at poolside starting from 9 in the morning until 5 in the afternoon every weekend of July. This is something kids and even adults can expect every summer. “It gets so hot in Temecula that it’s nice that our residents get to enjoy some treats while cooling off in our pools. I love seeing the kids’ faces when I ask if they want popsicles; of course, the answer is always a resounding ‘YES!’”, says Cierra Greene, Assistant Manager at Sycamore Terrace Apartments. Sycamore Terrace Apartments offers large one and two bedroom apartments in Temecula that are newly remodeled, complete with granite countertops, new flooring, doors, cabinets, dual paned windows, and more. Each apartment also comes with one covered carport, outdoor patio storage, and access to extra parking throughout the property.